On this website, here, there's a photo that they say will have skeptics "stumped". I'm referring to number 5, of course, this photo here, which has this supposedly ghostly lady taken in the picture. The guy who took the photo says he was taking a picture of a wildfire, and this lady was in the photo, but she wasn't there when he took it. This, then, is the diversion: What's going on in this picture, and what's this ghost lady doing here? You could say Photoshop, of course, but try and be a little more creative than that. This website says this photo has skeptics "stumped". Prove the website wrong. I'm as clueless as you are about this thing. A fun little game for the amateur skeptic. Let the debunking begin. Here’s another mysterious real photo that was posted to Reddit. User tony12684 said that his uncle took this photo many years ago while driving through New Mexico. In the distance he noticed a wild fire and wanted to get some photos. He pulled over and began photographing the scenery. At the time, there was nothing unusual of note except for the plumes of smoke in the background. Several weeks later when he got the photos developed he was shocked at what he saw. Right in the foreground is a mysterious lady in blue. The uncle insisted that no one else was around when he took the photos. The lady has sunken black eyes and a strange dark complexion. Her nose appears skeletal and her jaw looks gaunt and detached. There’s a shadow quality to her features that makes this photo eerie to look at. Her thin, outstretched arm ends in a stump with no fingers. The exact date the photo was taken is unknown but it’s obviously printed from film. It’s possible then that this could be a malfunction which has blended two images together. Yet the unsettling features of the woman in blue remain. Who is she and why has she appeared in this photo? 1. What's up with that white mark? Some greasy fingerprint? Looks like this picture was taken in the late evening, which would explain the shadow over the woman. Also "Stump with no fingers"? That clearly looks like a fist that she's making. Anyone from New Mexico here? Or someone who knows where exactly this was taken? Gonna link this topic to that Ghost Woo-meister on RW, so. *Are there any users from New Mexico that can shed some light upon this aswell? Looks just like a really rubbish pic to me. 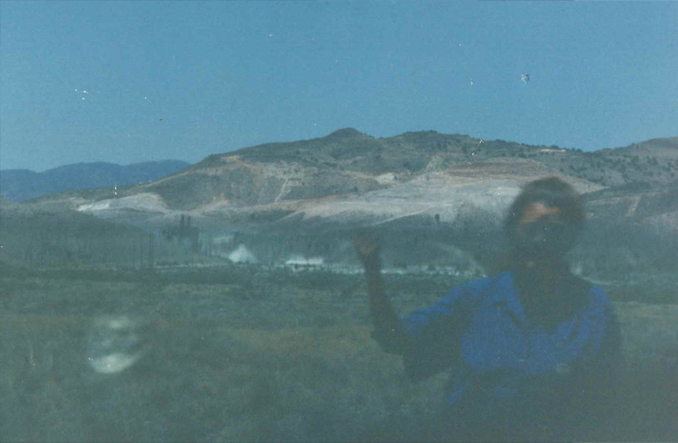 User tony12684 said that his uncle took this photo many years ago while driving through New Mexico. In the distance he noticed a wild fire and wanted to get some photos. He pulled over and began photographing the scenery. At the time, there was nothing unusual of note except for the plumes of smoke in the background. Simple: The Uncle either misremembered taking the picture, or he was yanking tony12684's chain. My guess is both. The woman is clearly there based on the way the light in the foreground is darker than the background. Or maybe a drop of water on the lens bending the light from the person in the photo. A bit too dark to discern the details exactly. I'm going to suggest that it's a long exposure, and the lady moved into the field of view and waved by raising her hand and waggling her fingers. Photo taken outside the car, reflected off the car window. Taken inside the car through the window, and this person was behind him at the other window as a reflection. The phrase "has skeptics stumped" is 100% always a lie. Attention grabbing subterfuge. Reality. Has credulous suckers stumped. Explain that paranormalists. Not a ghost. No chains or white sheet. Probably just a crappy picture. As some have said, a long exposure in which someone photobombed it while waving. But never mind the ghost what about all those UFOs in the sky? Have any of the paranormalists ever produced an explanation of how an object invisible to the human eye, which works by allowing light to hit a light-sensitive surface, shows up on a photo, which is made by light hitting a light-sensitive surface? I remember reading an article last year about some sort of grey like ghost that was posted here. In the comment section, there was this woman who said: "it's amazing what technology can do nowadays. Now we are able to film or take pictures from things and objects that aren't visible to the naked eye". Nobody can explain it. That's why it's so spooky. FLIR cameras see things that aren't visible to the naked eye all the time. So, for that matter, do x-ray machines and radio telescopes. Now, if someone had captured a ghost on a FLIR camera, that'd be a thing. Even the digital camera that works on totally different principles to old photography sees these things, it's amazing that two totally different technologies can "see" this hidden world yet the naked eye can't.